Our first trip to Hong Kong was only for a few days, but it is already one of my favourite cities in the world. It is a terrific blend of historic Chinese culture and modern soaring skyscrapers, colourful lights and green parks, bustling markets and beautiful Victoria Harbour. The city is compact so even in a short visit you can see and do a lot. At least enough to realize you will want to come back soon. 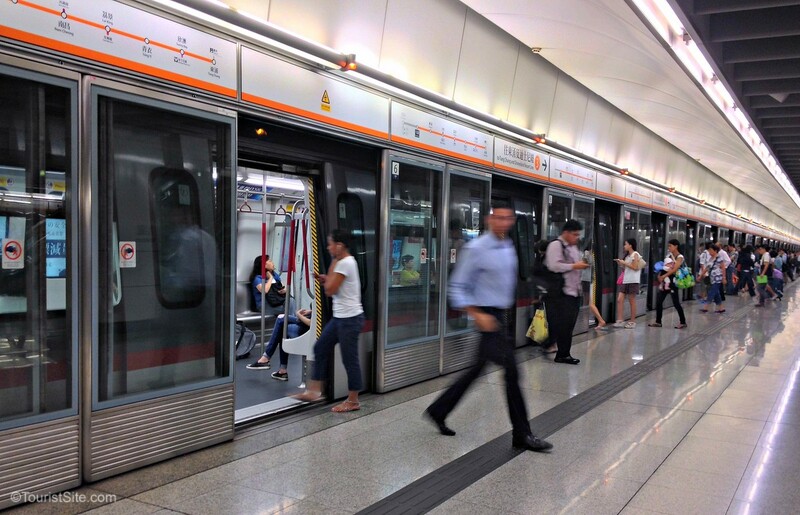 Getting around Hong Kong is easy with the efficient Mass Transit Railway (MTR) system. The MTR covers all major districts in the territory, including the Airport Express, Disneyland Resort, and the boundary with Mainland China. Purchase an Airport Express Travel Pass when you arrive for HK$300 (CDN$51 / US$39). Both include a refundable deposit of HK$50, and include one or two single journeys on the Airport Express, as well as three consecutive days of unlimited travel on the MTR. English is everywhere on signs and is fairly widely spoken, at least in tourist areas. So finding your way around is easy. 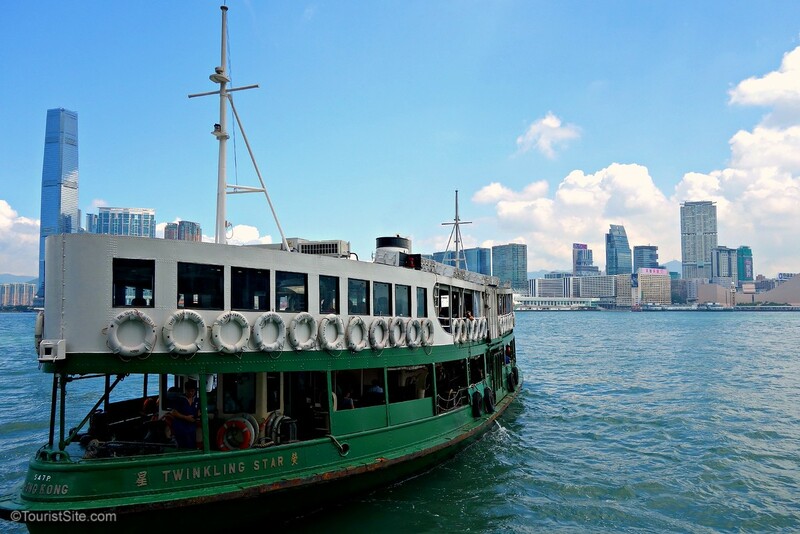 Hong Kong is an archipelago of 260 islands, and one of the best ways to view the city is from the water on the Star Ferry – one of the world’s biggest travel bargains. Splurge on an upper deck single ride ticket for about CDN$0.43 / US$0.32. A must-do when you visit Hong Kong. On the first clear day of your visit, go to The Peak! Victoria Peak is a mountain on Hong Kong Island, a dominant feature of the city skyline, and the highest point in the area. You can reach the peak via the Peak Tram, a 125-year-old funicular railway (the Tram departs near the MTR: Central Station, Exit J2). A view of Victoria Peak, from the Star Ferry. Once at the top, there are spectacular views of the city and harbour, as well as nature walks through the mountainous landscape. I would love to show you a beautiful photo of Hong Kong from the Peak. 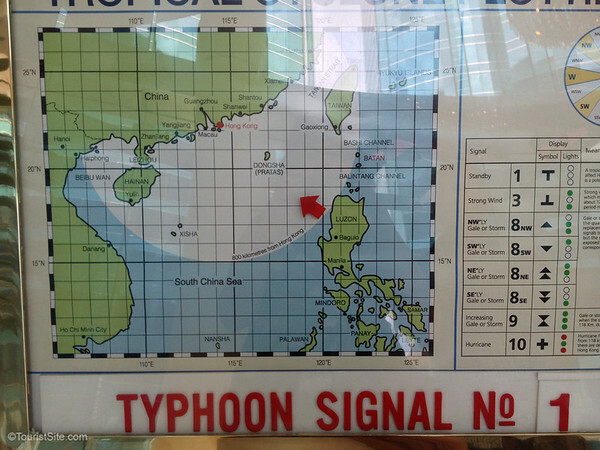 But we made the mistake of “saving this experience for last”, and instead experienced our first typhoon. On our return trip home from Asia we arrived for our last couple nights in Hong Kong, and saw this warning in our hotel lobby. The next morning the typhoon reached level 8, which pretty much shuts down the city. So, we spent most of that day in our hotel, until the typhoon passed through in the early evening and it was safe to venture out again. 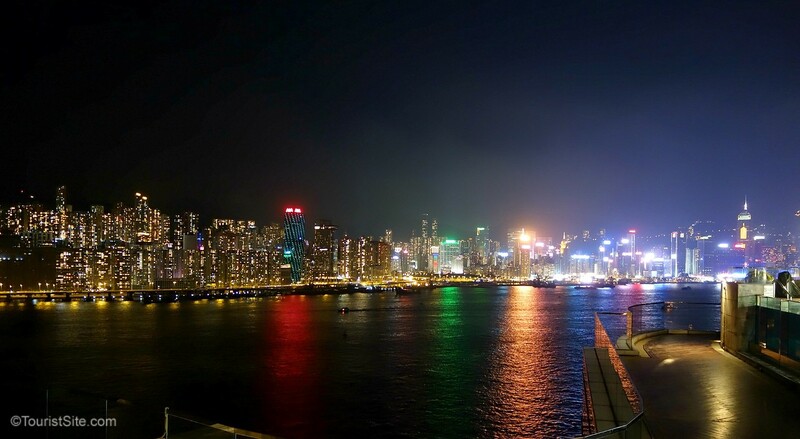 This view is from our second hotel in Hong Kong, the Harbour Grand Kowloon. The typhoon was an experience in itself, and thankfully it didn’t bring any significant harm to the city or its residents. Next time we visit Hong Kong, taking the Peak Tram will be the first thing we do! This is the view from the rooftop pool deck of the Harbour Grand Kowloon hotel. The view was so spectacular, we went for a swim even though it was pouring rain at the tail end of the typhoon. The pool attendant didn’t say if he thought we were crazy! You can check here for more about what to eat in Hong Kong, but if you love food you will find a lot to love. Definitely don’t miss Dim Sum with steamed pork buns and delicious dumplings! A fun and free thing to do is a ride up the Central-Mid-Levels Escalator, the world’s longest covered people mover. It is a series of escalators 800 metres (2,600 ft) long with a vertical climb of 135 metres (443 ft). You can hop off at one the exits such as the Soho district, for a drink or meal at one of the many restaurants lining the route, which we did. The escalator system was built in 1993 to carry workers back up the hill to apartments at the end of workday. Daily traffic exceeds 55,000 people, including many tourists. The escalators daily run downhill from 6:00 a.m. to 10:00 a.m. and uphill from 10:30am to midnight (so you will be walking one way). There isn’t really a viewing area at the top, as it leads to a residential area, but there are great views along the way. 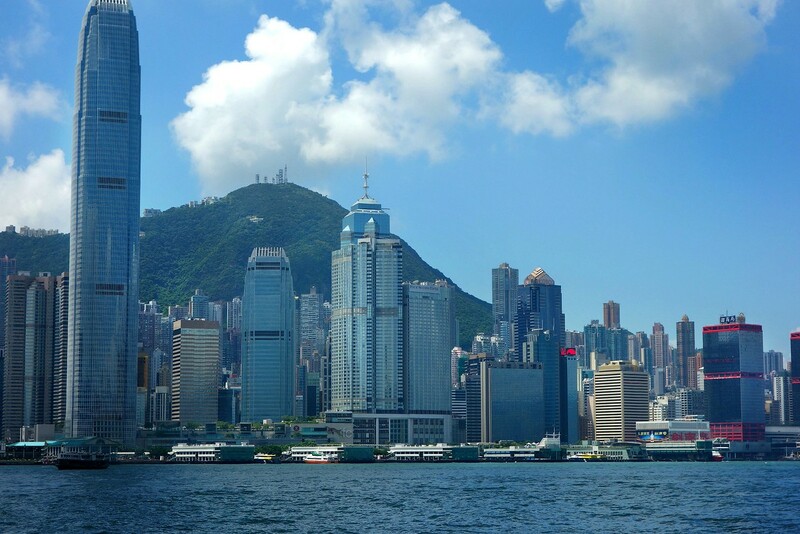 Hong Kong has a population of over 7 million, and is one of the world’s most densely populated areas. Most live in small spaces in high-rise apartments, but there are also many lovely parks to escape to such as Kowloon Park, or Victoria Park on Hong Kong Island. 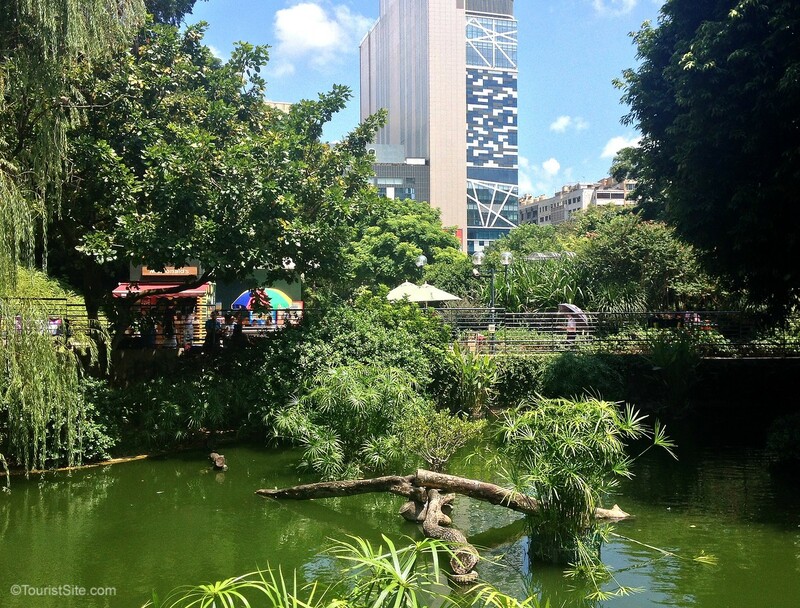 Kowloon Park is a cool oasis after shopping on nearby Nathan Road. From bustling markets to upscale boutiques – everything is available in Hong Kong: traditional Chinese tea and herbs, tailor-made suits, fresh produce, cheap electronics, and Gucci and Dior children’s boutiques for parents with an abundance of disposable income. We went to the Temple Street Night Market, but there are many more, including the Ladies Market and Stanley Market. 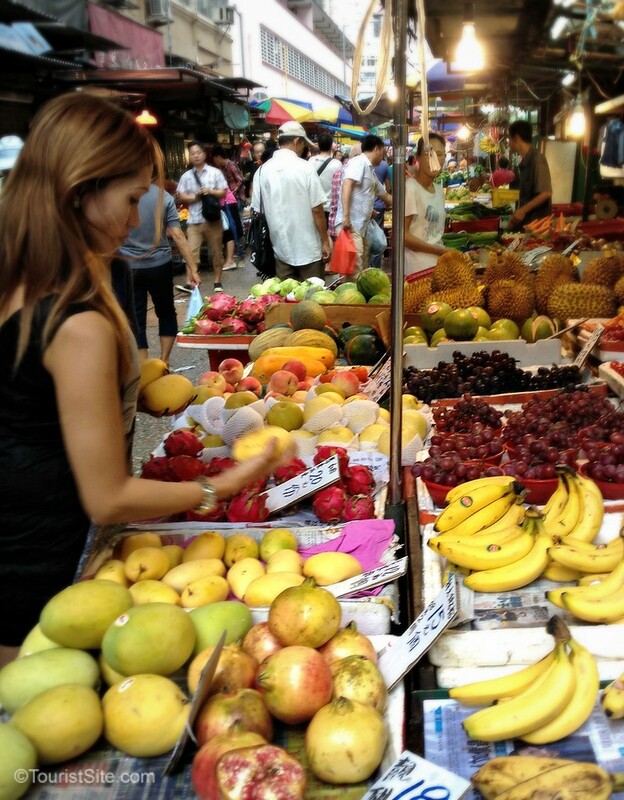 The Temple Street Night Market – One of the great markets in Hong Kong, with produce, electronics, and even Chinese opera singers. See here for more of our experiences in Hong Kong by Night. 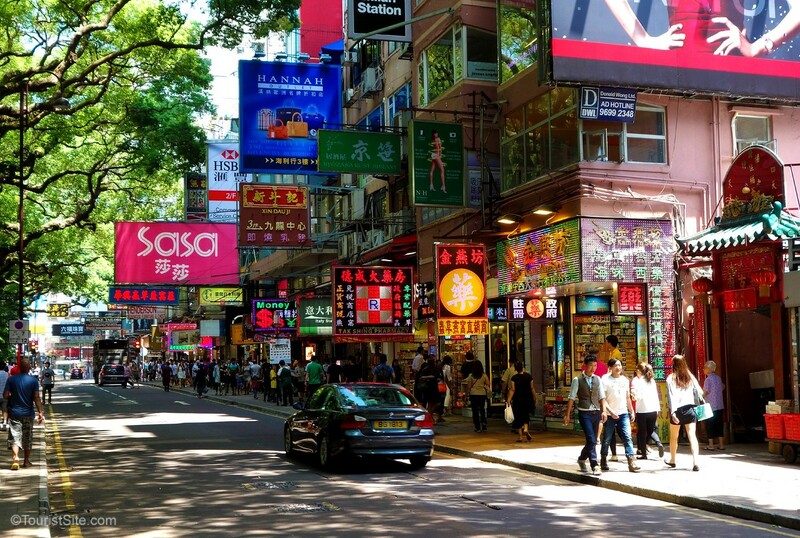 Walking and exploring is one of our favourite things to do, and Hong Kong is a perfect place to do it! 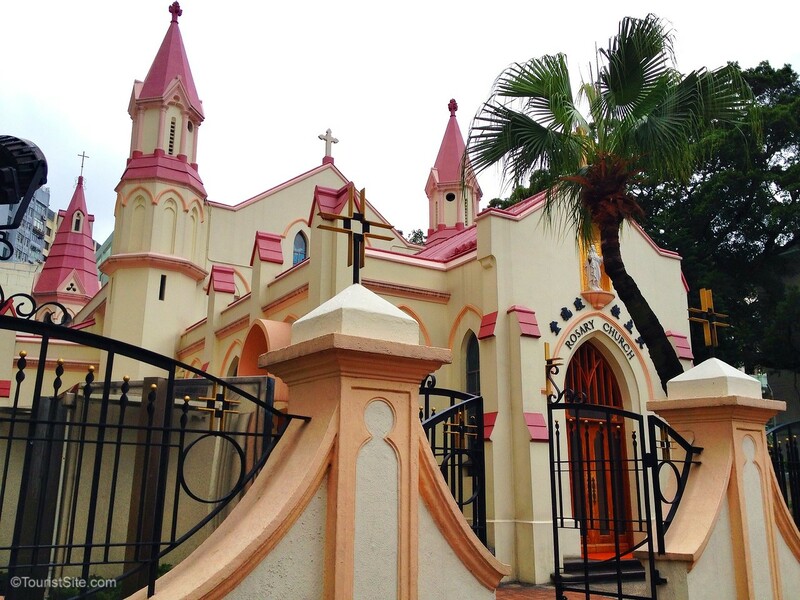 Rosary Church – This colourful church is the oldest catholic church in Kowloon, completed in 1905. 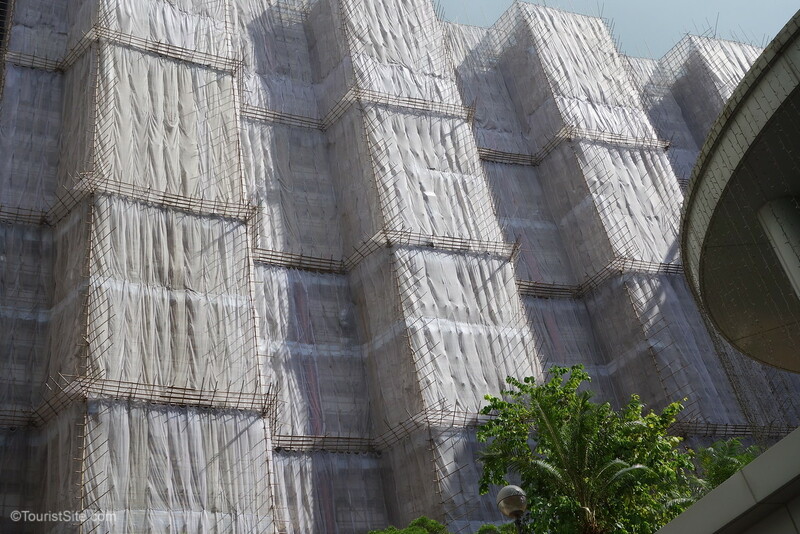 Bamboo scaffolding at construction sites. I’m fascinated by everyday things, done differently from how we do it at home. 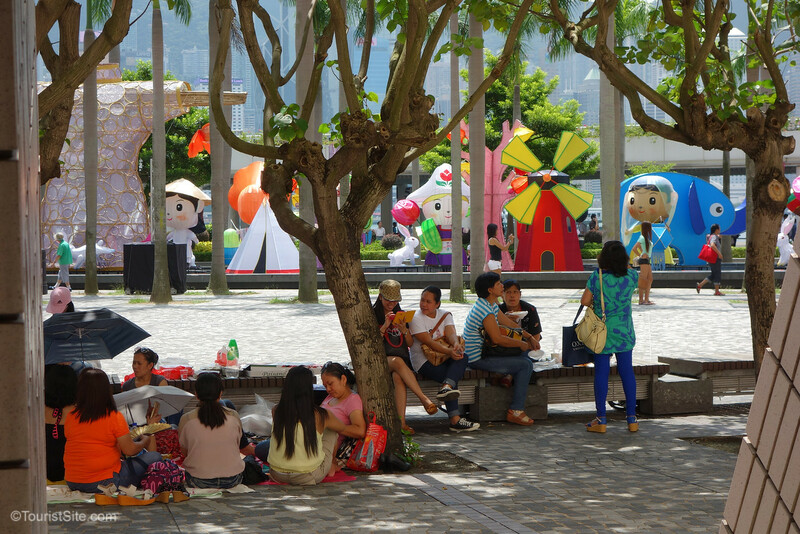 Finding shade on a hot day, with colourful lanterns from the mid-Autumn Lantern Festival. 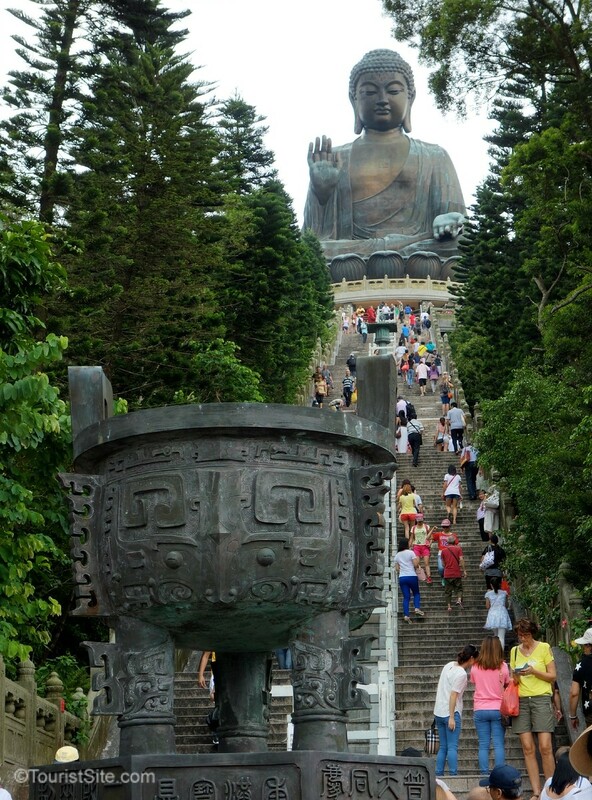 One of the more popular side-trip options is the short hop to Lantau Island, where you can see the (very) Big Buddha and Po Lin Monastery, as well as Tai O fishing village. We enjoyed both, although the cable car up to the Monastery area wasn’t operating due to wind, and I think we would have enjoyed it more than the bus ride. We just scratched the surface on our first Hong Kong visit. But I’m already looking forward to our next trip. I had a layover in Hong Kong way way back in 1993 when I took my big trip to Southeast Asia. I only had one morning to wander around the neighborhood and I have thought about going back again. Now your photos make me want to visit Hong Kong even more! My only visit to Hong Kong was solo and on a 24-hour stopover. And it was just before the handover that made it part of China. Still, your visit sounds a lot like my visit only longer, http://www.travellady.com/Articles/article-travelingsolo.html . Yes we were mainly hitting the must-see locations this trip. Beyond that we just enjoyed wandering around getting lost in the neighbourhoods. 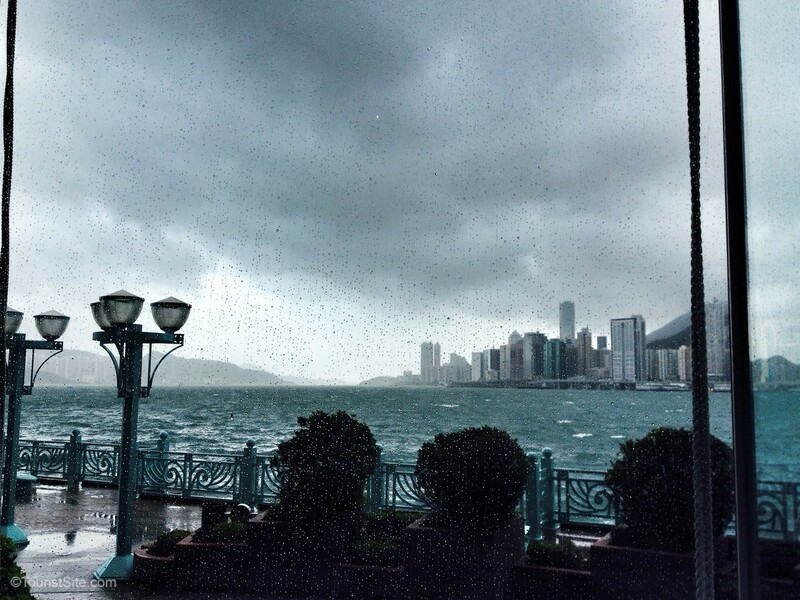 Your post has me jonesing for a long sojourn in Hong Kong, typhoon and all. Such a colorful and interesting place. Thanks Elaine. It’s a place we want to visit again and explore further.